Synthetic peptide within Human POU6F1/Emb aa 252-301 (internal sequence). The exact sequence is proprietary. Fetal Kidney Nuclear Lysate. Human intestine. Our Abpromise guarantee covers the use of ab30944 in the following tested applications. WB Use a concentration of 0.12 µg/ml. Detects a band of approximately 33 kDa (predicted molecular weight: 33 kDa). Good results were obtained when blocked with 5% non-fat dry milk in 0.05% PBS-T. The POU6F1 gene encodes a protein that is part of a family of transcription factors which exhibit distinct temporal and spatial patterns of expression. Immunohistochemical (Formalin/PFA-fixed paraffin-embedded sections) analysis human intestine tissue labelling POU6F1/Emb with ab30944 at 4µg/ml. 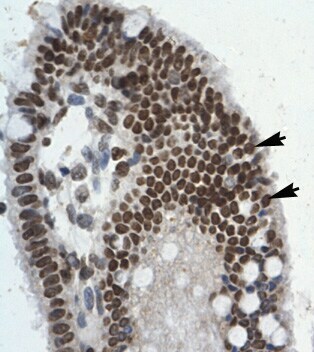 Arrows indicate positively stained epithelial cells of intestinal villus. ab30944 has not yet been referenced specifically in any publications. Publishing research using ab30944? Please let us know so that we can cite the reference in this datasheet. There are currently no Customer reviews or Questions for ab30944.